What Is SnoreShield Chin Strap? Snoring may seem like a minor problem until you actually end up snoring or living together in the same house with a snorer. Very soon, this turns into a humongous (and loud) elephant in the room that doesn’t let anyone get a good night’s sleep. Before long, people are constantly tired and cranky and the only way to remedy the problem is by sleeping in separate rooms. Luckily, there are some really smart people working on some truly great snoring aids. This brings us to our SnoreShield Chin Strap review, presenting one of the best and simplest anti-snoring devices. 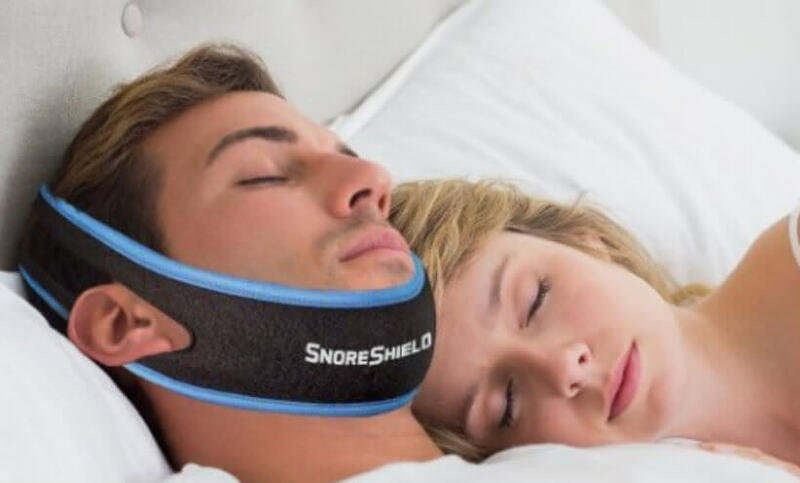 The SnoreShield Chin Strap is, well, a chin strap – probably the simplest kind of snoring aids but also surprisingly effective. The basic idea behind all chin straps (SnoreShield Chin Strap included) is to shut the snorer’s mouth during sleep while also pushing their jaw forward. This results in a more natural position of the soft tissues of the tongue and the back palate, thus letting the air flow freely and reducing or stopping snoring altogether. 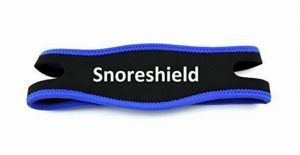 SnoreShield Chin Strap, like most other chin straps, is a simple, soft, and sturdy strap which you sling around your chin and fix at the back of your head with Velcro strips. We should point out that this mechanism of action requires you to fit the SnoreShield Chin Strap as snugly as you can. The special material used to create SnoreShield Chin Strap makes it comfortable, but you might still need a few nights to get used to the sensation. You may have already figured it out for yourself, but chin straps like SnoreShield Chin Strap do not really work for people whose snoring happens through the nose, i.e. the nose snorers. Moreover, if you are having problems breathing through the nose, whether because of a cold, an allergy or something else, you should not use chin straps at all. Many people who use CPAP machines should consider using a chin strap too. 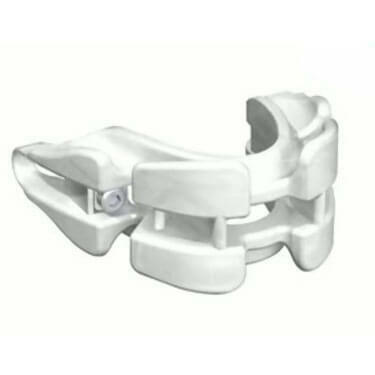 People who have used SnoreShield Chin Strap with their CPAP treatment all say that it has greatly improved their nights, making sure the machine is providing all the possible relief from snoring. For one, our experts still have to come across another chin strap whose manufacturers claim it has been clinically proven to alleviate snoring and help boost REM sleep. The manufacturers of SnoreShield Chin Strap do this with great confidence. We have not seen the clinical trials or any records of the trials, but we think this is something the manufacturer would not claim just to boost their sales. Our experts have confirmed that the SnoreShield Chin Strap is definitely among the most comfortable straps. That being said, one of our experts whose head is larger than your average head had problems with his SnoreShield Chin Strap. Maybe this is something they will address in the future. 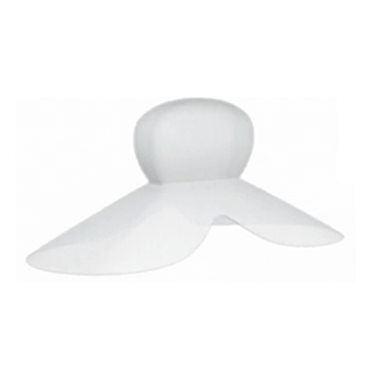 Using the SnoreShield Chin Strap is as easy as putting a strap around your head and all of our experts (except for the one with the big head) said that it is one of the lightest and most comfortable snoring aids on the market. One of them also tried it with her CPAP machine and after two nights, she said she noticed an improvement. SnoreShield Chin Strap is priced similarly to other chin straps and you can get it for $13.99. The good news is that your purchase is 100 percent risk-free since you can get your money back if you are not satisfied with the product. If you are still unsure if SnoreShield Anti Snore Chin Strap is right for you, check out the key advantages and flaws of this snoring aid. Our experts definitely like this snoring aid, as you can see from our SnoreShield Chin Strap review. It is a quality-made chin strap that can help the majority of snorers get rid of their problem. With the money-back guarantee, your potential purchase is literally risk-free. Our ratings are the result of an objective and independent evaluation of SnoreShield Anti Snore Chin Strap, generating the final rating that reflects the overall quality of the company. Ratings may change as the product introduces changes. SnoreShield Anti Snore Chin Strap user rating based on 4 user reviews. It definitely made me breathe through my nose and eliminated my mouth snoring problem once and for all. On the other hand, the material is not very comfortable and I still haven't managed to sleep through the whole night while wearing this. In the long run, I was also thinking of buying some sort of a mouthguard since I can see the strap messing up my teeth. They say it now has some improved features and design but I don’t really see it. Snore shield chin strap looks like any other chin strap, even the colors are the same. It works, though. I definitely snore less. 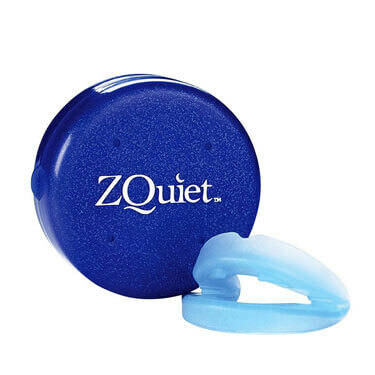 My snoring has stopped almost completely thanks to snore shield. My wife is beside herself with joy that she can sleep well again. We found 0 verified SnoreShield Anti Snore Chin Strap discounts for April, 2019. There are no SnoreShield Anti Snore Chin Strap coupons or discounts right now. 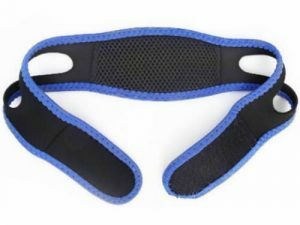 In order to be sure that SnoreShield Anti Snore Chin Strap truly is the best solution for your snoring troubles, you need to know what makes it superior or inferior to its alternatives. Discover how SnoreShield Anti Snore Chin Strap compares to other popular snoring aids of its kind with our detailed feature and price comparisons and easily determine whether you are making the right choice.